4 years ago, I have discovered Flickr, a wonderful site, just to make a little gallery for myself with my creative work. I did not know the impact it will have on me and on others, Flickr members & viewers. I have been getting many messages & emails from all around the world with warm responses to my work, most of them are telling me how happy my flickr gallery makes them feel – this always makes me happy too. One of the great Flickr influences on me was when in a complete surprise, 3 years ago, I got an invitation from France to give a workshop there. So, I was invited, 2 years in a row, to give workshops to several groups in France and have made so many and new sweet at heart friends. After my second visit to France, the girls have encouraged me to open a shop online - and my boutique on Etsy was opened a year ago. I was not sure then if that what I really want, but I have fallen in love with Etsy environment. My shop is still evolving but it is a place for creative people, polymer clayers and color lovers from all around the world. Thank you for following my Flickr gallery for the last 4 years, I'm wishing us for many many more. You have a great part in its ever evolving and growth; so, from my heart I thank you. I'm going to make 5 most fun raffles. If you would like, you may participate in all of them :) In every raffle, someone of you will win a gorgeous gift from me. I will upload those five gift pics on the day I will announce the happy winners. 4. The Blog raffle - I have opened a new, right here - just enter your comment and include your email in it please, so I can easily contact the winner. 5. The Fifth raffle - right after the 4 first raffles, I will make the fifth with ALL of the remaining participants names, and there will be a fifth winner :) Hope it will be you!!! עיצוב מדליק בעיני שיהיה בהצלחה !!! Enhorabuena por el aniverario y por tu nuevo blog.Tienes unas manos maravillosas para hacer esas maravillosas piezas con un trozo de pasta. 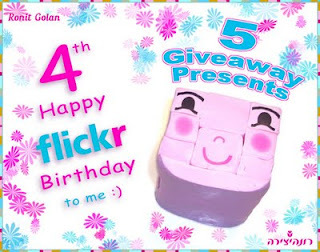 Happy Flickr Birthday! 4 years is fantastic! מזל טוב. איזו חגיגה נפלאה. גם בבלוג, כמו בעבודותיך, העיצוב כל כך נעים ומזמין. שיהיה המון בהצלחה עם הבלוג והחנות. Hi, it's very real good news!!!! Quel plaisir de découvrir ton blog; c'est une super nouvelle ! Happy Flickr anniversary from Italy!!! Je suis super contente de voir que tu vas faire un blog! Tes créations sont magnifiques. Déjà émerveillée par tes albums sur Flickr, je suis très heureuse aujourd'hui de découvrir ton blog ! Félicitations pour des 4 ans de Flickr ! Mazel Tov Ronit! j'admire tes créations, les couleurs pétillantes et lumineuses! tes albums sont un enchantement! Happy 4 year Flickr to you, I love, love ,love your work. ¡Felicidades! Hace mucho tiempo que te sigo, fuiste mi inspiración para que yo ame la pasta polimérica. Gracias.